You guys, I love the Golden Girls. Seriously. In fact, the only category for which I was ever of any use to my team in trivia was the Golden Girls (which, surprisingly, came up fairly often in our old trivia spot). I’m useless at pop culture, but I’ve seen just about every episode of the Golden Girls. So, when I found out about Sew the Show AND it happened to be the Golden Girls, I just knew I had to participate. Of course, actually coming up with a Golden Girls inspired outfit proved fairly challenging. I wanted to make something that I might actually wear, but still wanted something that seemed like it fit in with the theme. 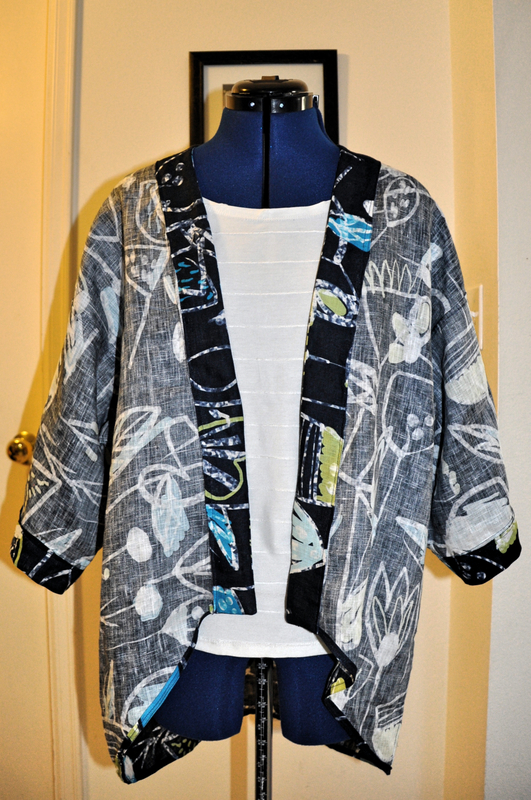 After much thought, I finally decided to make a kimono jacket and a tank top to go under it. I was going to make a pair of pants, too, but… babies… work… life… I ran out of time. The guts of the kimono jacket. 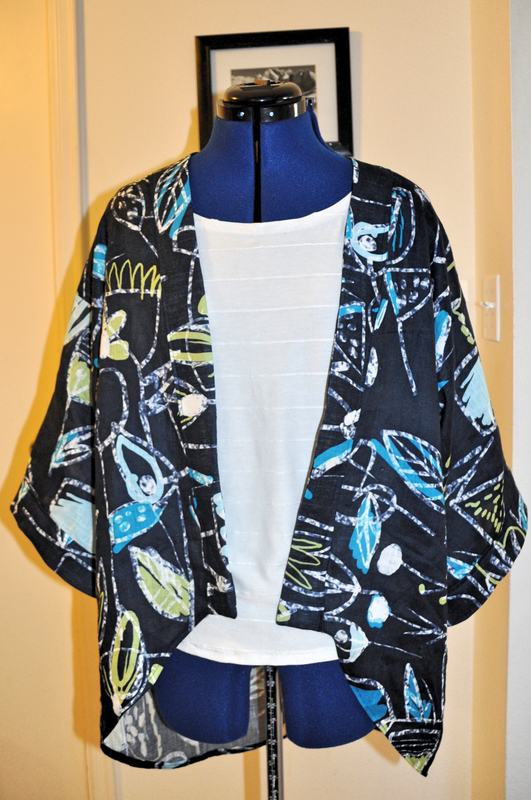 The jacket is Simplicity 1318, view b. The pattern is very simple and straight forward. To keep the insides looking nice, I used french seams throughout (french seams on the sleeves were a bit tricky…). The fabric is an Italian printed linen from Mood. I was looking for something that seemed like it would be in Golden Girls but one that didn’t look too “Florida retirement home” style. I found this fabric on moodfabrics.com, ordered it and hoped it would work for the kimono jacket. It’s a little stiff, but I think it works. I made a straight size medium with no alterations and I am really happy with the way it turned out. The pattern has quite a bit of ease, so, if you’re between sizes on this one, definitely size down. 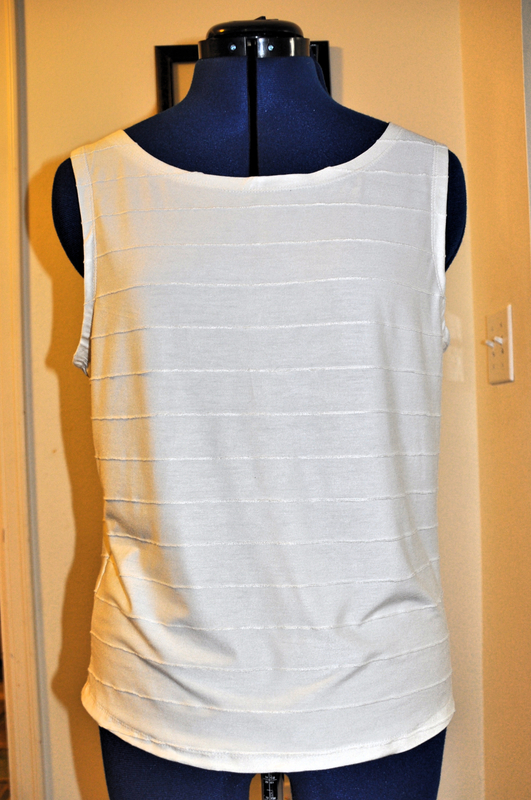 For the tank top, I used a knit I’ve had in my stash for a while (no idea where it came from at this point). I used Simplicity 5379, an out of print pattern I’ve had in my stash since I started sewing clothes. I love the fabric, but I’m not loving the fit of the tank top. Guys, I really need a good basic knit tank top pattern. I’ve tried out a few of them (this one, the Style Arc Diana Top, modified the basic tee pattern from the Sew U Home Stretch book, etc. ), but I have yet to find one that I like! It seems like it should not be this hard to find a basic tank top pattern that looks nice. But, I did get to use my new cover stitch machine (to be blogged about later…) which I loved. This makes working with knits so much better. Between that and my serger, this was a very quick make. This was such a fun challenge – taking a TV show and trying to make an outfit inspired by it, which I might actually wear. I can’t wait to see what next month’s show will be (at it’s new home here). 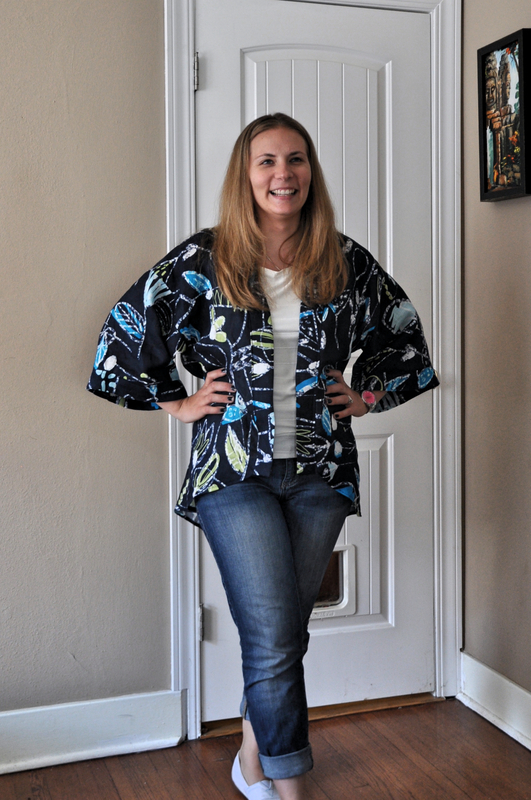 What a fun kimono-tee combo! Classy, yet comfortable–just like the Golden Girls themselves. Nice work. CUTE! You might check out this new tank top pattern from Kimberley Payne – http://www.straightstitchdesigns.com/product/greenwood/ – no experience with her patterns but just saw this on one of my FB groups. Also – I like the sleeveless tank in Pamela’s Versatile Twinset – http://pamelaspatterns.com/108-the-new-versatile-twin-set?ReturnUrl=LwBwAGEAdAB0AGUAcgBuAHMA. Couple of things to try anyway! Oh, I haven’t tried any of the Patterns for Pirates patterns, but I have heard good things. Maybe I’ll try that one, too. Thanks for the suggestion. Yay for the June theme – now I just have to start watching Parenthood so I can try to figure out what to make!